Tertullian, in his De Corona (3:2), written around AD 211, says that Christians seldom do anything significant without making the sign of the cross. Certainly by his time the practice was well established. Justin Martyr, in chapters 55 and 60 of his First Apology (Defence of the Christian Faith, addressed to the Emperor Antoninus Pius and therefore written between 148 and 155 AD), refers to the cross as a standard Christian symbol, but not explicitly to tracing the sign of the cross as a devotional gesture. In the ruins of Pompeii (destroyed 79 AD), there is a room with an altar-like structure against one wall, and over the altar the appearance of the plaster shows that a cross-shaped object had been nailed to the wall, and forcibly pulled loose, apparently shortly before the volcano buried the city. It is suggested that this house may have belonged to a Christian family, and that they took the cross and other objects of value to them when they fled the city. This is not the only possible explanation, but I do not know of a likelier one. 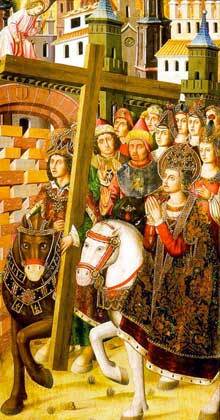 The Christian custom of tracing the sign of the cross on persons and things as a sign of blessing is very old. Some think that it goes back to the very origins of Christianity and earlier. In Ezekiel 9, we read that Ezekiel had a vision of the throne-room of God, in which an angel was sent to go through Jerusalem and put a mark on the foreheads of the faithful few who mourned for the sins of the city. Afterwards, other angels were sent through the city to destroy all those who had not the mark. We find similar visionary material in Revelation 7:2-4; 9:4; 14:1, where the mark on the forehead again protects the faithful few in the day of wrath, and it is said to be the name of the Lamb and of His Father. Now, the Hebrew word used for "mark" in Ezekiel is TAU, which is the also the name of the last letter of the Hebrew alphabet (the ancestor of the Greek letter TAU and our letter T), and it refers to a mark like an X or a +, two short lines crossing at right angles. When the Essenes (the Dead Sea Scrolls people) received converts into their community, they baptized them and then signed them on their foreheads with a TAU, in token that they were part of the faithful remnant who mourned the sins of Israel, and that they would be spared in the day of God's wrath. It seems probable that John the Baptist and his followers were in some measure influenced by the Essenes, and they had certainly read Ezekiel. Accordingly, the tracing of a TAU on the forehead may have been a part of John's method of baptism, and may have been adopted by the earliest Christians. (We remember that some of the Twelve disciples had previously been disciples of John the Baptist -- see John 1:35-37,40.) Very possibly they began by tracing the TAU without asking what it meant -- it was simply a mark, the mark mentioned by Ezekiel. Later, they may have identified it with the Name of God. The Essenes, in some of their documents, used four dots in place of the four letters of the Name of God, and sometimes arranged them in a square. It would be easy to interpret the four ends of the TAU as representing the four letters of the Name of God. Later, Christians, especially Greek-speaking Christians, might interpret the sign as a CHI, an X-shaped letter, the first letter of the word XPICTOC, or Christos, meaning the Annointed One, the Messiah, the Christ. Again, Christians might understand it to be the sign of the Cross of Christ, and it is this interpretation that has prevailed. Today, in many Christian churches, when someone is baptized, the baptizer afterwards traces the sign of the cross on the forehead of the newly baptized person. Often, some of the water that has been used for baptism is saved and placed in small bowls near the entrance to the church. Worshippers entering the church touch the surface of the water and then cross themselves as a way of reaffirming their baptismal covenant. (A few years ago, a Jewish friend asked me, "May I go to the Easter Midnight service with you?" I said: "Certainly, if you like. However, I must warn you that there will be baptisms, and that afterwards the priest will take a bowl of baptismal water and a sprig of hyssop, and walk up and down the aisle sprinkling the congregation with the water, and if a single drop touches you, you will instantly turn into a goy." He answered, "I will bring an umbrella and open it at the appropriate time.") As we have seen, the practice of using the sign of the cross in connection with Baptism may very well go back to the Apostles themselves, and back before them into their Essene and other Jewish roots, having its origin in the vision of Ezekiel. In fact, the concept may go back further than that. We read in Genesis 4 that, when Cain had killed his brother and was sent into exile, God set a mark (TAU) on Cain, so that no one would slay him. Thus, from the start, the Sign of the Cross has been the protection of the penitent and justified sinner. Again, as one preacher has said, if you were telling someone how to make a cross, you might say (at least to an English speaker), "Draw an I and then cross it out." As we make the sign, we first draw a vertical stroke, as if to say to God, "Lord, here am I." Then we cancel it with a horizontal stroke, as if to say, "Help me, Lord, to abandon my self-centeredness and self-will, and to make you the center of my life instead. Fix all my attention and all my desire on you, Lord, that I may forget my self, cancel my self, abandon myself completely to your love and service." "The churches will tell you that Jesus was put to death on a cross, but that is a lie. He was nailed to a single upright beam, with his hands directly over his head. The cross is a pagan symbol, actually a letter T, or Tau, standing for the god Tammuz, who was worshipped by the Canaanites. When you wear a cross, or make any religious use of a cross, you are really worshipping Tammuz, whether you know it or not; and any church that displays a cross, or sings hymns like "The Old Rugged Cross," or "Beneath the Cross of Jesus", actually has its origins in Tammuz-worship, and is an instrument of the Devil, and if you want to avoid the wrath of God, you had better flee from all such churches and sign up with the only organization in town that teaches Bible truth and is devoted to the pure worship of God and not of idols like Tammuz, and here I am, ready to sign you up." It is therefore of some interest to know what evidence we have about the shape of the device on which Jesus was nailed up to die. Minucius Felix, a Christian who wrote a work called Octavius, probably a little before 200 AD, says (chapter 29) that the shape of the cross is to be found everywhere you look. Indeed, we see the sign of the cross naturally formed by a ship when it carries a full press of sail, or when it glides over the sea with outspread oars. Note that a ship with a single vertical mast and a triangular sail is a modern device, used for sailing upwind by repeated tacking. The ancients did not do this. They used a ship with a square sail, and a vertical mast with a horizontal spar across it to hold the top of the sail. Hence a cross shape. Note also, that it is not necessary to agree with Minucius Felix that there is anything significant about the many places that the shape of a cross can be seen. What matters is that he knows that his readers will understand the shape of a cross to be two beams at right angles, not just a vertical beam. The Greek word for the cross of Jesus, used many times in the New Testament and in early Greek Christian writings, is stauros, and the corresponding verb is staurizo = "crucify". Now, do any early writers use these words in a way that would make it clear what shape they were talking about? "Consider the word SUN. How good a thing the sun is! It is the source of light and warmth, and is indispensable for life itself. Along comes the letter T, and changes the word to STUN. What does it mean to stun a man? It means "to knock him out cold--to ice him," or to deprive him of warmth. It means "to punch his lights out," or to deprive him of light. It means "to knock him dead," or to deprive him of consciousness, and potentially of life itself. What a villain the letter T is, to turn good into evil in this fashion. (Several other examples follow.) And consider that evil thing, the STAUROS, instrument of torment and shame and death. It takes its name from the letter TAU, because it is shaped like a TAU. What an evil device, and what an evil letter it is named for!" With this system in hand, some Jewish students of the Scriptures noted the numerical values of various words or sentences, obtained by adding up the values of the letters, and found symbolic significance in the results. This is called gematria (from the Greek word for "geometry", here understood to mean mathematics in general). Obviously, the possibilities are endless. Some Christians made similar use of the numerical values of Greek letters. Thus, since Jesus was crucified on Friday, the sixth day of the week, 6 stands for evil and death, as does its intensive form 666. But Jesus rose two days later, on what may be called the eighth day of the week, and so 8 is the number of resurrection, of renewal, of life restored and triumphant. It is thus no accident that the letters in the name of Iesous add up to 888. Now for a particular example. In Genesis 14 we read that an invading army captured Abraham's nephew Lot and some others, and that Abraham took a band of 318 warriors, followed the army and in a surprise attack rescued the prisoners. Jewish scholars noted that 318 is written Cheth ("ch" as in "Bach," please) Yod Shin. Now Cheth Yod spells "chai," which means "life." Shin is the first letter of "shalom," which means "peace, deliverance, wholeness, well-being." Thus Abraham's group of warriors had 318 men in it, and was a source of life and peace to the prisoners whom they rescued. Sometime between 70 (when the Temple was destroyed) and 135 (when Jerusalem was sacked again and a pagan shrine built on the site of the Temple), a man called Barnabas, or the pseudo-Barnabas, or Barnabas of Alexandria (not to be confused with the companion of Paul mentioned in the book of Acts), wrote a book called The Epistle of Barnabas, in which he points out that 318 written in Greek letters is Tau Iota Eta. Now, Tau clearly represents the cross, and Iota Eta are the first two letters of the Name of Jesus. Hence, the source of the life and peace that Jewish scholars had discovered in Abraham's 318 men is none other than the cross of Jesus. Now, whether you think that that is a remarkable insight, or think that Barnabas of Alexandria is a complete air-head, is beside the point. The point is that he would not have used this argument if he did not know, and expect his readers to know, that a cross is shaped like a Tau. Thus, we see that among pagans and Christians alike in the second century of the Christian era, a time when crucifixions were a common method of execution and everyone knew what they looked like, there was a general understanding that if a man had been crucified, it was probably on a vertical and a horizontal beam.